KARACHI: Benazir Income Support Programme (BISP) has signed an understanding with Uber Pakistan for creation of a large-scale economic opportunity program for BISP beneficiaries. The understanding focuses on creation of economic opportunities for women beneficiaries by providing them vehicles and CNG rickshaws by Uber Pakistan. This partnership will help women entrepreneurs acquire requisite skills for driving and complete associated licensing requirements for rickshaws and other modes of transport, as well as other trainings that enhance candidates’ digital literacy, operational excellence, entrepreneurship skills, communication and customer care abilities. 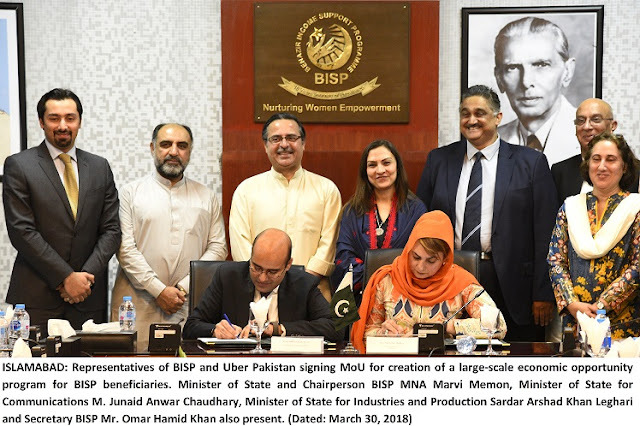 The MOU was signed today at BISP HQs in the presence of Chairperson BISP MNA Marvi Memon, Minister of State for Communications M. Junaid Anwar Chaudhary, and Minister of State for Industries and Production Sardar Arshad Khan Leghari. Chairperson BISP MNA Marvi Memon termed it as follow-up of meeting between Prime Minister Shahid Khaqan Abbasi and Mr. Dara Khowsroshahi, CEO of Uber Technologies Inc. at the World Economic Forum (WEF) in Davos in January 2018. She said that it is an important initiative as BISP has credible data of most vulnerable women in the society who could be provided respectable earning opportunities through this. Ms. Memon further said, “The safety, security and dignity of BISP beneficiaries are most important to us.” She hoped that the partnership will help BISP beneficiaries exit the poverty trap. Speaking on the occasion, Mr. Chaudhary termed it as a unique and innovative partnership while congratulating the management of BISP. He said that, “It will be a game changer for rickshaw and taxi services in Pakistan.” He further added that the partnership should be replicated in other smaller cities, if it is successful in the major cities. The minister also offered the driver’s learning and licensing by Motorway Police to the beneficiaries of this partnership. Under this partnership, a pilot project will be conducted to test run the potential of Uber for benefit of BISP beneficiaries. The vehicles will be supplied without any down payment and it will include target instalment of Rs. 8000 monthly for five years repayment for BISP Beneficiaries. Similarly, for rickshaws, target instalment of Rs. 5000-8000 monthly, for five years repayment for BISP Beneficiaries. Secretary BISP Omar Hamid Khan stated that he was particularly excited about this MOU as this will take forward BISP beneficiaries in terms of technology as well as women empowerment. The main focus of the partnership will be kept on inclusion of women beneficiary drivers in the programme for women empowerment. A pilot project comprising of 100 BISP beneficiaries will be launched in Karachi, Lahore Rawalpindi and Islamabad with 25 beneficiaries from each city. It will consist of asset transfer of Rickshaws and Vehicles on zero collateral and easy instalments to selected beneficiaries. It will also include training of selected beneficiaries regarding road safety, security, health, nutrition etc. by tagging in different training agencies with the BISP beneficiaries targeted by the programme. This partnership recognizes that the adoption of technology by marginalized & low income groups, specifically women, who are beneficiaries of the BISP programme, will help alleviate poverty and provide sustainable economic opportunities.